Well, it’s a little about Twitter. Twitter provides an amazing social media tool for teacher collaboration. Twitter provides an innovative platform for professional development. Twitter promotes an engaging forum that excites and drives teachers. 3 years ago we were inspired by Jimmy Fallon to launch discussions on Twitter around a hashtag. Our understandings about leading and participating in TwitterChats have evolved into a practice that promotes growth and has become the cornerstone of teacher collaboratin across our district. Teaching is deeply personal. Teachers design, implement, and facilitate learning opportunities reflective of passion, knowledge, and drive. When sharing about their practices, they need to feel safe, supported, and encouraged. Professional learning has to be more than “sit and get”. Teachers need an opportunity to learn, try things out, reflect with other teachers who are implementing similar practices, and refine their practice based on those conversations. Leading a TwitterChat can be messy. Will we have enough participants? What if there are too many? Will they understand this question? We can honestly say that we’ve lost a little sleep thinking about those things! The devil is in the details. Attention to detail, asking open-ended questions that could lead in a million “messy” directions, but this where the learning lies. And, where the fun begins. Just answering questions isn’t enough. We have learned that in order to gain the most from TwitterChats teachers need to do more than just answer questions. Our TwitterChats intentionally help teachers learn how to respond to others’ answers, ask questions to dig deeper, and develop collaboration that spans beyond the chat. Our TwitterChats are professional developments. They lead teachers through 5 carefully scaffolded questions. Each question dives deeper into a single topic. As conversational tweeting begins, teachers are prompted to provide examples and details. The tweeting culminates with a “challenge”, encouraging teachers to continue their learning. - We have honed our TweetChat process over the last 3 years. During the brainstorm, we choose a topic, word the questions, and develop the challenge. This crucial step supports the “Connecting the Dots” lesson, thus engaging teachers in rich, ongoing discussion. We quickly learned that 140 characters with a detailed, well-crafted question simply did not work well. We created images, opening a world of possibilities. Themed images. Opening statements prompting thinking. Thought-provoking questions. Scheduled by quarter, we chat via Twitter once a month. Advertisements include the topic, details, and leaders. This allows for teachers to feel they can join the chats at any point! Leading a TweetChat can be overwhelming. There is strength in numbers. We employ a 3 person TweetChat system. Moderator: This tweeter leads the discussion, tweets the images, and opens and closes the chat. Co-moderator: This tweeter encourages tweet-responses, asks probing questions, and digs deeper into the participant's’ tweets. Sweeper: The sweepers job is to watch for the # in everyone’s tweets, allowing for all novice tweeters to participate. The sweeper also retweets, replies, and encourages. These are the visible roles. Behind the scenes, we have a back-channel of communication. Frequently via text, this is a space for questions, panic during “dead-air”, and assistance with timing. We have grown a process that inspires change, engages teachers in authentic professional learning, and connects teachers across our district. We have grown a learning experience that develops leaders and creates a better tomorrow. 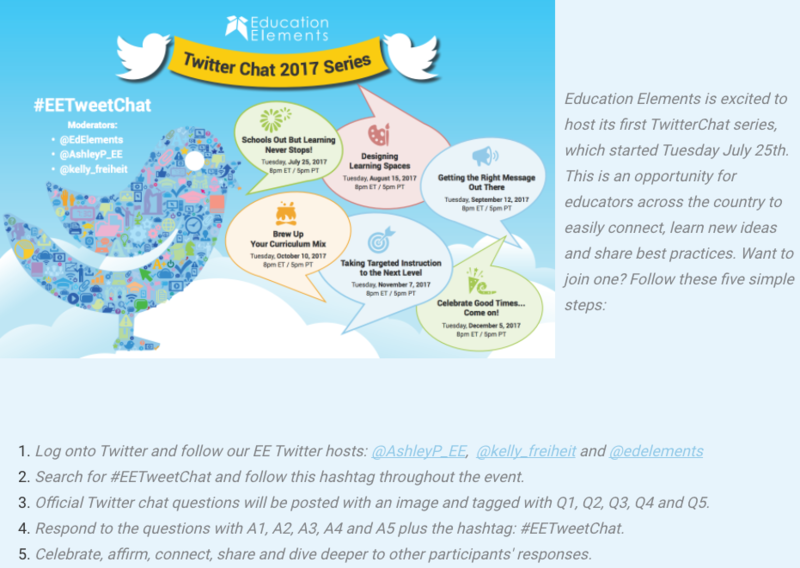 We joined in the Education Elements PL Summit on May 10-12, and we had a blast sharing our Twitter experience with the attendees. 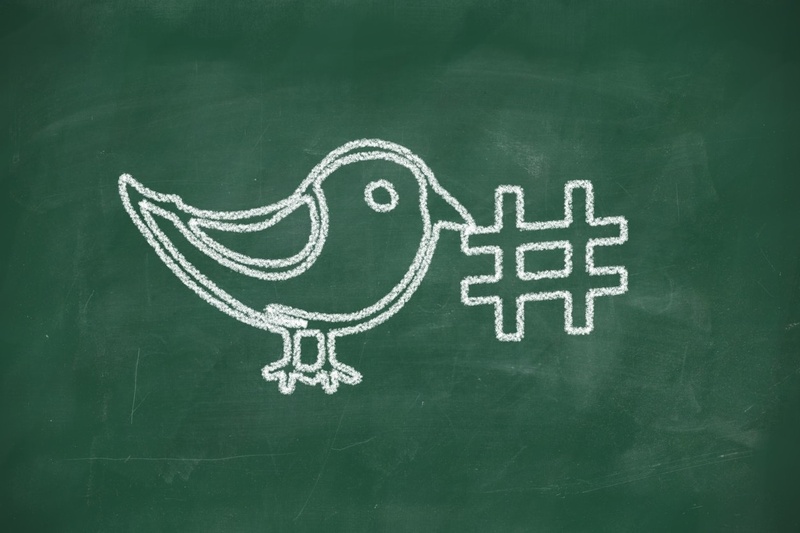 Want to learn more about TweetChats? 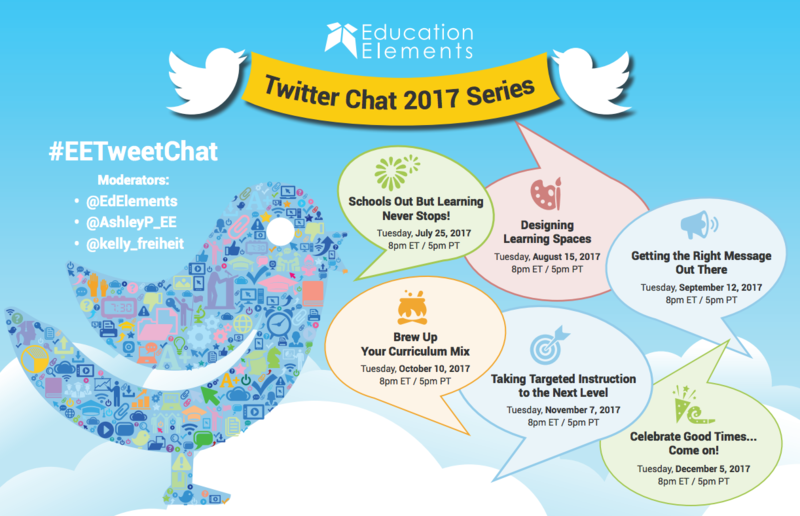 Join Ashley and Kelly for their 2017 Tweet Chat Series #EETweetChat, and check out all the tweets from our first #EETweetChat on July 25, 2017 "Schools Out but Learning Never Stops"